This camp is one week of crazy fun! 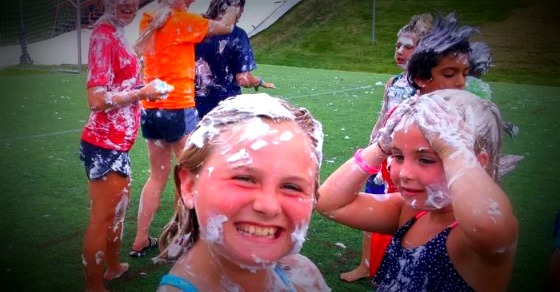 Each day will feature a different crazy theme: Wet and Wild, Field Day, OYA-lympics, and more! Activities will feature large and small group games each day, tons of arts and crafts, relay races, contests of all sorts, tie-dye, a dunk tank, inflatables and of course the Slip-N-Slide that all the campers love so much! We will even have a camper talent show on Friday, so start working on your performance early! What could be better than having a whole 10 acres up for grabs for any activity under the sun? Children will have the freedom to decide what activities they want to participate in each and every day of the week during this camp. Campers will be encouraged to try out all activities, but will have the liberty to spend more time with the ones they like the most. campers, ages 4 to 13. Space is limited to 150 campers. Lunch and dessert bar are included everyday for all campers. We will have a camp cookout one day!